Too often we Catholics forget that it is not just those who come into the Church at Easter who are converts. Even those of us who came to the baptismal font in our mother’s arms are converts. At some point we have to decide if we are going to become disciples of Jesus. But it doesn’t end there. Every day we have to choose between Christ and the world. And what a world. It is a world filled with noise, and distractions, and so many lovely temptations. Every day we sin, and we must turn back to the Lord. We are the Church militant and our lives are a constant battle to choose the narrow way that leads to eternal life. 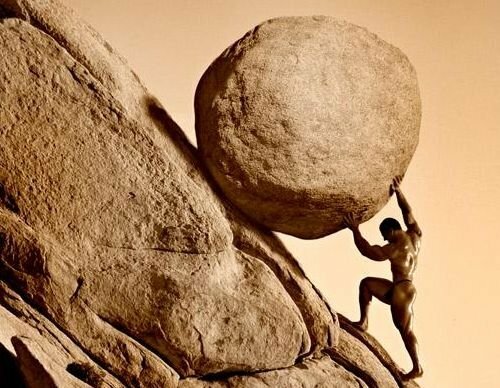 It is an endless process, and when we get weary we can feel like Sisyphus pushing the bolder up a hill only to have it roll right back down the hill again. Just when we think that we have this striving for holiness thing down—and start hi-fiving ourselves—we sin. Like Sisyphus we reach the summit only to tumble down the mountain once again. But unlike Sisyphus our efforts are not pointless. If we continue to strive to be friends of God we will one day wear crowns of victory in the heavenly kingdom. Without Jesus we would indeed be like Sisyphus. Jesus gives our life hope and purpose. With God all things are possible. Catholicism is not for wimps or for people who want to be popular. It is for people who want to really know Jesus. It is for people who don’t mind being called weird, or stupid, or bigots. Adult converts know this. Most of them have faced rejection and anger as they journeyed toward Christ’s Church. Jesus doesn’t want groupies. He wants people who are willing to give up their lives, pick up their crosses and follow Him. Jesus doesn’t want us to stay down in the muck and dirt of our sins. He wants us to be pure and spotless as the day that we were washed clean in the waters of baptism. It is not an easy life. Continual conversion, transformation, and discipleship hurts. It costs. It involves gut wrenching change. It often involves rejection and even persecution. When I was a child I learned to roller skate by going down a steep hill. Every day I would fall and skin my knees. But I kept at it until I finally mastered the hill and skating. I did it by persevering. It was an act of my will. Well being stubborn did help. We cannot, however, become holy by human efforts alone. That is why Jesus gave us the sacraments. In confession, Jesus forgives us and restores us. Jesus nourishes us with his very body and blood in the Eucharist. The Sacraments give us the strength to keep climbing up the mountain no matter how many times that we fall down. That is why I chose to be Catholic. It is the easiest way to heaven. That is why Catholic is who I am not what I am. It is the only way that I know to say yes to God with all my heart. This entry was posted in Catholic, Discipleship, Holiness, Uncategorized and tagged Catholic, Christianity, Converts, discipleship. Bookmark the permalink.